Many people worry about hitting an animal while driving. Hopefully you’ll never experience this, but it might be helpful to read our advice on what to do if it happens to you. It may be easier said than done, but if the worst happens, stay calm, breathe deeply and take stock of the situation. If you hit an animal which is covered by The Road Traffic Act 1988 – namely, dogs, goats, horses, cattle, donkeys, mules, sheep and pigs you are legally required to report it to the police. But if you hit an animal not mentioned in the Road Traffic Act – a cat or a fox for example – you are not required by law to report it but you might want to inform the police of the incident anyway. Read on for our advice on cats and deer. So you’ve hit an animal while driving – what should you do next? If you’re involved in an accident and an animal (whether in another vehicle or on the road) is injured you must stop, even if it wasn’t your fault. If you have to stop, you must stay with your car long enough for any other involved parties to ask for details should they need to. This could be the injured animal’s owner, the RSPCA or the police. If you’re in shock, you might not put your own safety first and there’s a chance you could do something you wouldn’t normally do. But it’s very important that you are aware of your surroundings and that you watch out for other cars or hazards that could put you or anyone else in danger. Before approaching an injured animal, bear in mind that it is likely to be very scared and it could try to bite or scratch you. If you think you may have hit someone’s pet, see if you can find its collar to access its owner’s contact details. Remember if you hit a dog or other animal mentioned in the Road Traffic Act 1988 you are legally required to inform the police. If the animal isn’t wearing a tag and you aren’t able to trace its owner you must report the incident within 24 hours to a police officer or at your local police station. If the animal needs urgent attention, the police should be able to provide you with a list of vets available to attend. Sadly, seeing an injured wild animal by the roadside is commonplace, particularly in the countryside. If you find an injured wild animal on the road, observe it – as long as it’s safe – to try to assess how badly hurt it is. Then call the RSPCA on 0300 1234 999, or if possible take it to a vet or wildlife rehabilitator. How do I find my local vet? Find your local vet here. You will not be responsible for paying the vet’s fees. It is a sad reality, but cats are frequently involved in road accidents. Seeing someone’s pet harmed by the roadside is devastating, but it’s helpful to know what to do if you should come across one in these circumstances. If the cat can be moved, take him to a vet and inform them that you are not the owner. If the cat can’t be identified, inform your local community that you have discovered an injured cat and taken it to the vet. Putting up posters may help raise awareness and inform the owners of their cat’s whereabouts. Between May and June, and October and November accidents involving deer are more common due to the rutting season and young deer dispersing. 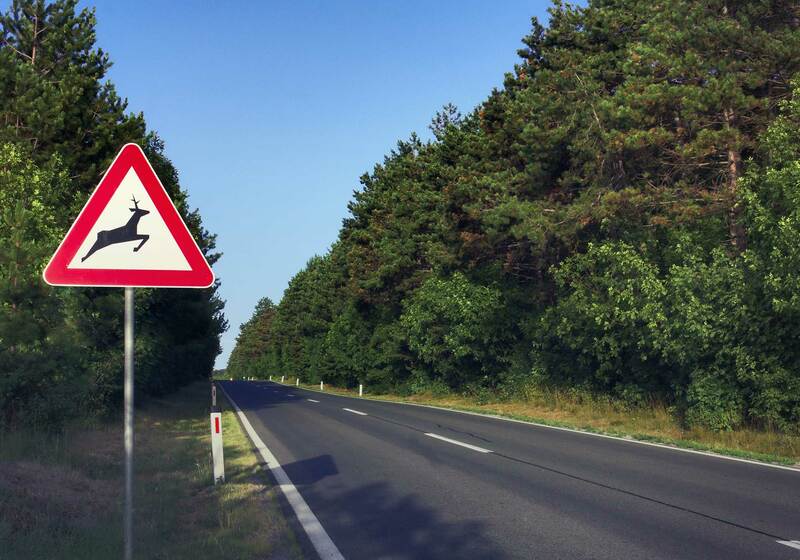 There are approximately 74,000 accidents involving deer each year in the UK, with vehicle damage estimated at around £17 million. – Keep to the speed limit – it’s there for a reason! It is the local council’s responsibility to remove animals found on the road. To find the relevant contact number click here to enter the relevant postcode. The RSPCA has some very helpful resources about protecting and caring for animals. If you’re worried about your own pet, you might find the Blue Cross website helpful. If you need to make a claim as a result of damage to your car, read the guide on the main insurethebox website. We hope you never have to experience a car accident involving an animal, but you may want to save the RSPCA 24-hour advice line number to your phone, just in case: 0300 1234 999.